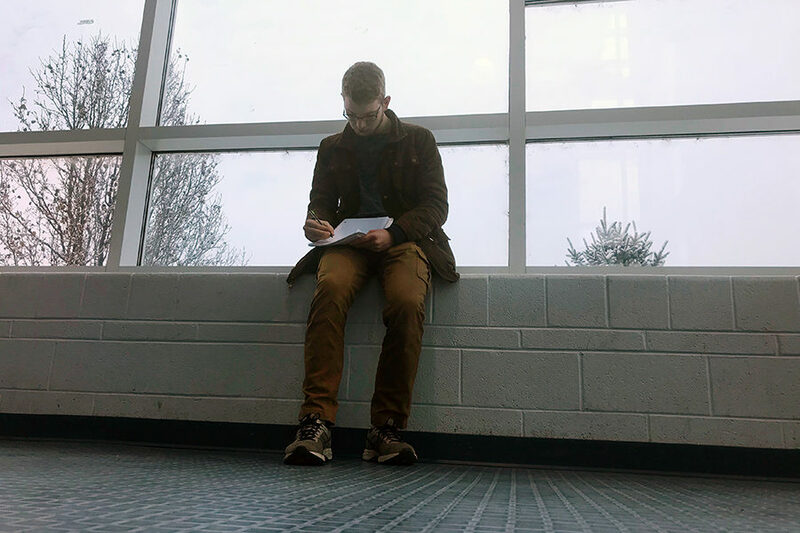 Senior Evan Wood sits at the window on a snowy day writing poetry. It wasn’t the readings of some centuries-old writer that gave senior Evan Wood the idea to begin writing poetry, but rather work for a class back when he was a sophomore. “It was just for an assignment in my English class and I thought that doing poetry was pretty cool. I looked up a little more [about it] and I was kind of inspired by that,” Wood said. While he originally wrote exclusively for his classes, Wood began to realize after a short time that he not only enjoyed writing poems, but was getting pretty good at it too. “I started writing a couple of pieces in my psych class, just about psychology and stuff. Looking back at it, I thought, ‘This isn’t that bad,’ and I showed some of my friends…they thought it was pretty cool, so that really helped me get into [poetry] more,” Wood said. Since then, Wood has begun writing more and more. 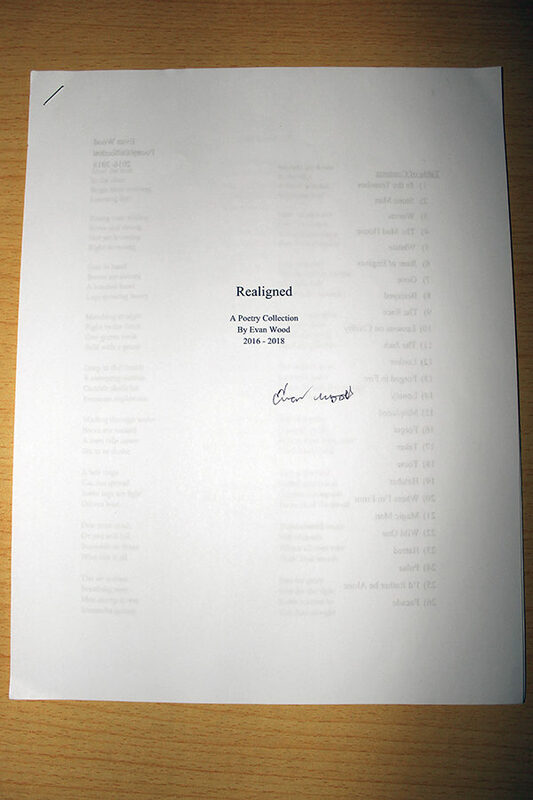 He recently completed a package of 26 poems that he’s gradually compiled over the past couple of years. Wood acknowledged that he’s seen his writing improve over the years, and he’s worked more recently to refine his craft. Although Wood writes his poems for personal enjoyment, he also hopes that he’s able to spread a message to his readers through his writing. “I try to portray an image that makes you think a little bit more. I really want to get people thinking about the mind and how you can impact other people’s lives. That’s kind of my message that I put into my poetry,” Wood said. Many of Wood’s poems are based off of experiences, whether they be his brother’s, who is in the US military and currently stationed overseas, his own or the people around him. Through reading his writing, Wood has hopes that his poems allow other people to make connections to their own lives. Of the over two dozen poems in Wood’s collection, there are a few that stand out for him as special. “Recently, I wrote one called ‘Forged in Fire’. I wrote that one about my brother, so that’s very important to me of course. [Another] one would be ‘Pulse’. That was when I really noticed that my writing had changed and almost leveled up in a way, taking that next step to become that much better,” Wood said. As of now, Wood posts his poems on online forums, as well as showing them to his classmates around school. Though he’s currently keeping his production relatively hidden, he does have future plans to put his name out there. “Everybody tells me I should publish and eventually I will. But for now, as my short-term goals, I just post online; nothing too major. I’m just going to keep writing, keep setting more goals for myself and keep going,” Wood said.